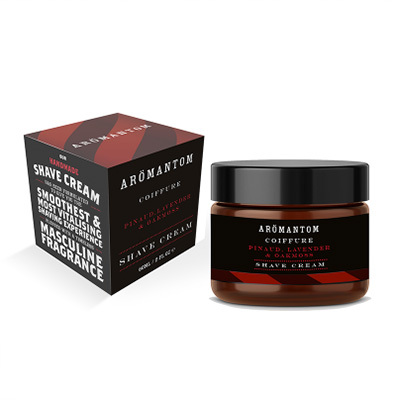 Shave Cream by Aromantom offers a light, natural and fresh fragrance. It contains nutrients which soothe, soften, moisturise and reduce redness of the skin which may occur during shaving, as well as promoting skin healing and regeneration. Upon application, the cream produces a profuse lather which softens the beard for a more comfortable, close shaving experience. Formulated with a blend of moisturisers to create a uniquely smooth and creamy lather. Product is 60ml approximately and comes boxed. Shave cream directions: Lather a thumbnail sized amount of shave cream on your brush – it is recommended that you apply the product with a shave brush. As well as helping you evenly apply the product, the brush also helps lift the hair up from the skin so once you run the razor through it, it creates a very close shave. If unavailable, you can also apply the cream using just bare hands. Lather the Aromantom Shave Cream to the required area to be shaved and always shave with a clean, sharp blade. After wetting the skin, apply the shave cream onto the area of your face with stubble. Ensure to soak the skin for approximately four minutes. For best results, a hot towel can applied to the face – this is recommended, but not necessary. Shave using a straight razor or a typical razor. Complete the shaving ritual by applying one of our Solid Colognes. They are specially formulated with natural bases and butters. Our solid colognes will help moisturise and fragrance the skin once all the facial hair is removed. The shave cream provides a great protective barrier for the skin whilst shaving whilst preventing drag. Aqua, Helianthus annuus Seed Oil, Butyrospermum parkii Butter, Glyceryl Stearate, Theobroma cacao Seed Butter, Cera Alba, Sodium Stearoyl Glutamate, Glycerin, Sucrose Stearate. Linum usitatissimum Seed Oil, Olea europaea Fruit Oil, Benzyl Alcohol, Coco-Glucoside, Xanthan Gum. Coconut Alcohol, Aloe barbadensis Leaf Juice Powder, Tocopherol, Lactic Acid, Zingiber officinale Root Extract. Dehydroacetic Acid, Essential Oil, Parfum.